The Sonicare Essence toothbrush is part of Sonicare’s e-series, featuring easy-to-use screw-on brush heads for effective everyday plaque removal. As a market leader, Sonicare uses patented sonic technology to remove up to 2x more plaque than a manual toothbrush, rivalling their many competitors (view on Amazon). While electric toothbrushes have become more popular in recent years, Sonicare makes choosing a long term toothbrush less daunting. This is because they design their brushes with new users in mind. As a result, Sonicare’s superior sonic brush movements and EasyStart program sets the brand at the forefront of the market. Despite advancing toothbrush technology, not all features are created equal, and it is worth bearing in mind that some features are more important than others when it comes to guaranteeing an effective oral hygiene routine. This Sonicare Essence review is here to help. How does Sonicare Essence work? How does Sonicare Essence compare? Who is Sonicare Essence suitable for? EasyStart program to increase brushing speed over the first 12 uses. Unlike other models, Sonicare Essence has a no-frills design, with just 1 clean mode for easy use. On top of that, Sonicare Essence uses 31,000 brush strokes per minute, giving a gentle yet powerful cleaning experience that helps to remove stains without damaging tooth enamel. The 2-minute timer helps you to keep track of your brushing time for optimal cleanliness. While the soft-grip handle encourages easy use, Sonicare Essence also includes an angled brush head to help you reach tricky areas and ensure even brushing. Besides that, the e-series brush heads are designed to fit the Essence toothbrush securely and to optimize the brushing experience by ensuring comfort. 1 Sonicare Essence toothbrush handle. 1 e-series standard brush head. Along with this, Sonicare offers replaceable e-Series brush heads and also a separate handle. 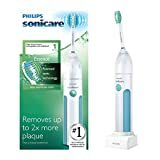 Removes up to 2x more plaque than manual brushes. 2-week battery life (longer than other brands). 1 easy clean mode for ease of use. Deeper clean than standard electric toothbrushes. Bristles fade to remind you to replace brush head. Less battery life than some costlier models. Lacks features such as the illuminated display. Sonicare Essence uses sonic technology to create high speed vibrations, which results in 31,000 brush strokes per minute. This high brush speed is what makes a sonic toothbrush. In contrast to other models like PowerUp, which can reach up to 15,000 strokes, Sonicare Essence can offer more effective cleaning that rivals its competitors. The Sonicare Essence toothbrush has 1 cleaning mode. Although this means it lacks other options, it makes the brush easy to operate and ideal for everyday use. With the average brushing time for Americans estimated as 45 seconds, the ADA recommends using a timer to ensure the suggested 2-minute brushing time. With this in mind, Sonicare’s built-in 2-minute Smartimer helps users to keep track of their brushing time and to encourage even brushing. The Sonicare Essence toothbrush has a battery life of 2 weeks, which is longer than the Essence+ model. While brands like Oral B having an average battery life of 7 days, Sonicare’s battery life is relatively high and more eco friendly than most electric toothbrushes. Like most of Sonicare’s toothbrush packages, the Sonicare Essence toothbrush kit has a standard charger to ensure the toothbrush is ready to use whenever you need it. Along with its charging base, the Sonicare Essence toothbrush comes with 1 e-series replacement brush head. This is a screw-on refill head designed to fit the e-series models, including the Essence handles, along with the Elite and Xtreme brushes. The listed Sonicare models all include 1 brush head refill and the Sonicare Smartimer. Although HealthyWhite+ is more costly than Sonicare Essence, they both include the same brush strokes per minute and provide an equally effective clean. Brushing mode Clean 3-intensity clean 3-intensity clean and white. Those seeking a no-frills design. Those who are new to electric toothbrushes. Those looking for an easy-to-use toothbrush for everyday cleaning. At the same time, Sonicare Essence is less suitable for those with sensitivity or those seeking a more whitening geared clean. However, FlexCare+ is designed for those with sensitive gums as it has three intensity settings (two of which are aimed towards gum care and sensitivity). Along with this, the standard Sonicare FlexCare brush also has a whitening option for those looking to brighten their smile. While Sonicare’s immediate battery life is usually praised, its longevity is sometimes criticized because most brushes only last 1-2 years. With this in mind, many still opt to use Sonicare as its immediate battery life is convenient and the brand is reputable and trusted among dental professionals. It is worth noting that correct use of Sonicare products is important. Sonicare recommends charging each brush for 24 hours before its first use and to avoid keeping it on charge constantly. In short, the Sonicare Essence toothbrush is most suited to those who are new to electric toothbrushes or who are seeking a hassle-free brushing experience. With its low-to-mid range price tag, this brush is affordable for many users. Due to its angled brush head and gentle cleaning action, Sonicare Essence is effective for everyday users and for those with dental restorations or braces. In contrast to manual brushes, the Sonicare Essence toothbrush uses patented sonic technology to ensure you get a superior clean every time. Does this model come with a charger? Yes; this model comes with a standard charger for everyday use. Will this clean my teeth the same as more expensive Sonicare models? Sonicare Essence uses the same patented technology as other Sonicare models, meaning it can guarantee an effective and even clean. This brush has 1 cleaning mode and generates up to 31,000 brush strokes per minute. In comparison, some costlier models have more brush strokes per minute and a more varied selection of cleaning modes suited to whitening and sensitivity. Can I use e-series replacement heads on this model? Yes; the e-series replacement heads are made to fit the Essence model. Are the brush bristles soft or hard? The Sonicare Essence toothbrush has soft bristles that are designed with dental restorations with mind. Because of this, they are unlikely to cause any damage or discomfort. How often should I clean this brush? Sonicare recommends removing the brush head and rinsing the product once a week. Why do the bristle colors change? The bristle colors fade over time to remind you when to replace the brush head. Is this brush suitable for toddlers? This brush is less suitable for younger children as its intensity build-up can be too strong for children’s teeth and gums. However, Sonicare offers a Sonicare for Kids toothbrush that has low and high intensity settings. Does this model include the 30-second interval reminder? While this model has a Smartimer that runs for 2 minutes, it does not include the 30-second quadpacer to remind you to move on to the next quadrant. The Sonicare Essence brush head does not turn like a rotary head. Instead, the brush vibrates at 31,000 brush strokes per minute. Can I change the intensity setting? This brush has one intensity mode for cleaning which cannot be increased. However, the EasyStart program will begin at a low intensity and slowly increase the speed over 12 uses. 1.4 x 1.8 x 7.8 inches.